Hello Citizens! Today The Relay are proud to host an article by Firespikez and Mr. Combustible. Firespikez and Mr. Combustible do amazing work on Star Citizen-based props, 3-D printing things like marine armour, ships, and weapons. Check out the article below, and we hope you enjoy! I’m Firespikez, I assist Mr. Combustible from time to time with his Star Citizen projects by acquiring the models from CryEngine or the Holoviewer. With Mr. Combustible’s latest project, I acquired the Retaliator model and imported it into 3ds Max so I could tear the model apart and make parts move. The first step is getting the files from either the Holoviewer or the game files themselves. The models from the Holoviewer and the game files are very different, but both have advantages. I would say that the Holoviewer models are better for smaller prints. They tend to lack the internal detail the game files have so they can require less work before a print. However, the Holoviewer uses older models, so there might be some outdated designs which can be a problem for folks who want the “Current” version. You’ll also need a program called “CTM viewer” to open the models from the Holoviewer. To get a Holoviewer model you’ll have to go to the Robert Space Industries website and visit the Pledge Store. From here you’ll need to choose a ship you want a model of, for this example I’m choosing the Gladius. To pull the model from the Holoviewer you’ll need to view the pages source code. Most browsers will do this by pressing the “F12” button. Once you see the page’s code search through it for a “.CTM” file, this will give you the folder path of the model. For example searching the Gladius page I found “/media/oibvdxxco2narr/source/AEGIS-Gladius2.ctm”. I would take this file path and put in my browsers URL bar after typing ” https://robertsspaceindustries.com “. Once the file is downloaded you’ll need to use CTM viewer to save it as an OBJ, STL or whatever file format you prefer. The models you can get from the game files are very detailed and are great for large, high-detail prints. However, since the models have a crazy amount of internal detail, a few programs will be needed like WinRAR or 7-Zip, but most importantly you’ll require the PAID version of CryEngine to access the files. You’ll need to start by locating your Star citizen folder. By default the files we need can be found in “c:\program files\starcitizen\citizen client\data” . You may need to associate your unzipping software with the “.pak” format, or you can spend ages renaming the “.pak” extensions to “.zip”. I use WinRAR so I select all the copied “.pak” files and just right click “Extract here”, this step might take some time depending on the speed of your PC, but once it’s done you can copy the newly created folders into the CryEngine “GameSDK” folder or other designated folder. Once the files have copied over you’ll need to go to the new“Objects/spaceships/” and search for the “Chrparam” files and delete them, otherwise you’ll get errors while trying to open the ship files in CryEngine. You should now be able to open the CryEngine and view the game files. Be aware that a lot of ships are made up of a lot of different parts and can be a pain to line up. Once you’re happy, select all the parts you want and click “File -> Export Selected Objects” in the top left corner. This will export the models into an .OBJ file in a location of your choice. During this phase I spend a lot of time talking to Mr. Combustible about exactly what he wants, what I can do, and bouncing ideas off each other, so I tend to go back and rework a lot of changes I’ve made using feedback he gives me. I’m far from a professional so I won’t get technical like I did during phase one. As I stated before, a lot of ships are now coming in many pieces, the Retaliator exterior alone has over a dozen parts, plus engines, turrets, etc… This does not include the interior so this can be a nightmare to line up, but the modularity means I can remove the interior detail with ease. We wanted the Retaliator to move… to feel more than a static shell, and the existing model was great for a virtual model but for a physical model it wouldn’t work. So one of the things I did was make sure the turrets move. I installed some “wells” on the ship body for the turrets, and Mr. Combustible later installed “pegs” onto the bottom of the turrets so they would sit into the wells. Another project I worked on was the RSI space suit, I’ve since learnt a lot of tricks to make things quicker but a lot of that was going through and removing “fabric” pieces, sealing holes and tearing things down into more manageable sections. Once everything looks good, I send the converted files to Combust and he will work on the files some more and fix my many faults. So basically I do some of the file work, I then pass it over to him and he does the REAL work. 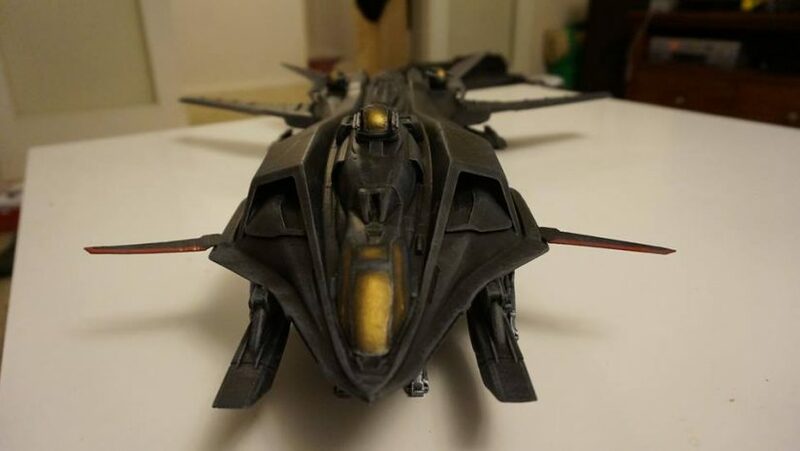 I’ve built a few projects from Star Citizen like ships, helmets and more, you can find me on Facebook. Real work is all relative! When you do not have the 3D skills then the building is the easy bit. So at this stage I have been speaking with Firespikez about what the end result will be. For example if it’s a ship/weapon then things can be solid, a helmet/armour will need to be hollow but then shelled (given a wall thickness) so it can be printed. All the individual parts will need to be pulled off and made into separate parts. For the sake of simplicity I will be working on a ship for this article and so the first step will be to put all the prepared parts into a program called netfabb to make certain they are all together in one spot. The next step is to scale the parts to the final size needed. Keeping in mind that a really small ship will need all the small parts either left out or redesigned due to the fact they will not print correctly (or at all in some cases). In the case of printing weapons, helmets, and armor I use a scaled male model for reference. If it’s a large print the next step will be to slice the models to fit on the print bed. The trick to this is to make a cube sized a bit under the available print area and use this in netfabb to slice things up. The next step is to stitch the sides up if they were not automatically triangulated in netfabb, and repair any issues. Once I’ve finished in netfabb I will export each part as a scaled *.stl in a separate directory, .stl is my printers native file format. I use the UP Plus printer software to start printing the selected pieces, fitting them within the print area of 13x13x13. Depending on size they can take up to around 7 hours to complete, I’ll need to do several runs in order to print all the parts. Some projects can take weeks to print all the pieces. I have an enclosure surrounding my printer to help prevent warping in prints due to temperature changes and other external influences. I also need to check the print head to make sure it’s feeding properly and how much filament is left in the spool. If an issue has occurred such as warping or the printer has run out of filament I might need to re-print the whole part or there may be a chance to salvage it. The Up Plus 2 printer is capable of a resolution of .150 Microns (0.15mm) but I normally print at 200 microns as it’s a faster print and it’s easier to remove off the printer bed. Once there are a number of parts you can then glue them together. I use ABS plastic, which can be fused together by dabbing the edges in acetone and pressing them together, This creates a strong clean join and I’ll use body filler for the joins, then give it a good all-over sand with 120-grit sandpaper. I generally use a thick primer filler spray to fill in the print lines and it sands very well. I may do 3-4 passes of sanding back and respraying the primer. The primer doesn’t fill in the detailed areas which is an added plus. There is a product called XTC-3D from Smooth-On which is a 2 part resin you paint on the prints and makes for an amazing surface after sanding. This unfortunately fills in the details so is not suitable for anything like a ship or weapon, but is great for a large helmet or armour. After sanding to a point where the joints no longer show (Spot putty helps) you can give it a light sand with 240-grit sandpaper, then another coat of primer. The model will then be ready for painting. Having reference images of the model is handy even if you’re giving it a different paint scheme.